Rathmullan House is a Blue Book bolthole very much rooted in its locality, says Rachel Dugan. Country houses usually stand in splendid isolation; luxury rural retreats that offer sanctuary from the outside world, so much so that the county you are in can become irrelevant. Rathmullan House is different. Its menus are crammed with local food and drink. The house dates from 1820, with 34 elegant rooms, but it also offers a swimming pool, a sandy beach at the end of the garden and couches just crying out for a good book. The friendly staff speak with a lyrical lilt and their greetings are as warm as the roaring log fires. Whether you're a couple or a family, it all ensures guests soon acclimatise to the laid-back, Donegal way. The award-winning Cook & Gardener restaurant is not to be missed, with the focus on generous portions of locally sourced produce, some from the hotel's own walled garden. If a second night of indulgence seems a bit much, Rathmullan has the perfect 'guilty pleasure' solution - beer and pizza. A collaboration with a nearby craft brewery and local artisan baker Scarpello & Co has seen the creation of the Tap House, a bar-come-pizzeria housed in a renovated space once home to the original house's kitchens. Top-notch wood-fired pizzas start from €9. Teamed with a Kinnegar brew, it's a fun and affordable add-on to the country house experience. Before the Wild Atlantic Way, there was the Atlantic Drive, a breathtakingly beautiful route around the Rosguill Peninsula that will have you ooohing and aaahing as new vistas reveal themselves around every (hair-raising) bend. It's definitely worth the 40-minute drive from Rathmullan, especially if you take the scenic route back over the stunning Lough Salt, stopping for a pint in the Olde Glen Bar in Glen. 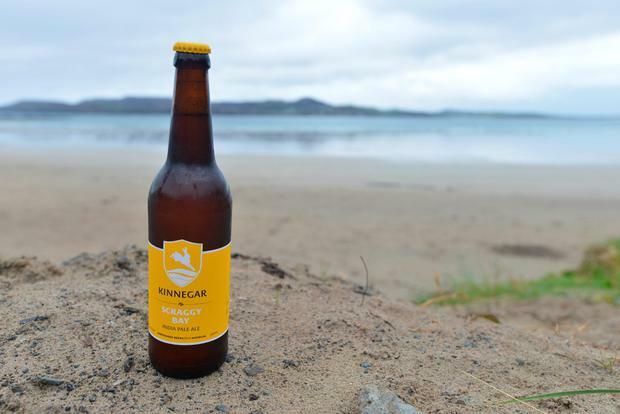 If you like the local on-tap tipples available at the hotel, make time for a visit to Kinnegar Brewing (kinnegarbrewing.ie). Founded by Libby Carton and her husband Rick LeVert, the microbrewery occupies two small outbuildings on a farm overlooking Lough Swilly. The pair's enthusiasm is infectious, and tours (€10) are worthwhile, even if you've only got a passing interest in craft beer. The pale ales are popular, but stout fans should give Yannaroddy a go - deliciously fizzy on the palate with a hint of coconut! Rathmullan itself is a quaint seaside village and magnet for sailing enthusiasts and families during the summer. There are some lovely seafront pubs worth checking out for the ultimate 'pint with a view'. Chief among these is the terrace at the Beachcomber. Rathmullan House's 'Winter Warmer' package is the perfect excuse for a pre-Christmas getaway. Two nights' B&B with one evening meal in the Cook & Gardener restaurant is priced from €205pps on select weekends in November and December. Contact (074) 915-8188 or see rathmullanhouse.com for more. Special offers for other Blue Book properties can be found on irelands-blue-book.ie. To find out more about the local area, log on to rathmullan.net.